Search Engine Optimization (SEO) is a complex topic. There are several things you can do to improve your site’s chances of ranking better, but they involve a decent amount of work. It goes to show when it comes to SEO, there are no shortcuts. However, some tools enable you to pawn off a bit of the legwork. For example, some SEO plugins purport to use machine learning to help you format your content more efficiently. In this article, we’ll talk about how machine learning is impacting SEO, and then show you how you can use the WordLift plugin to take advantage of these developments in WordPress. First off, let’s discuss the difference between artificial intelligence and machine learning. Artificial intelligence refers to the broad concept of systems that are capable of mimicking cognitive functions, such as learning and problem solving. Most of us are familiar with the concept due to its portrayal in popular media, but for the most part true artificial intelligence is still relegated to realm of science fiction. In most cases, when people talk about artificial intelligence, they’re actually referring to machine learning. This is a subset of the field of artificial intelligence research that deals with self-improving algorithms that improve as they’re given more information to process. As good as those algorithms can get, they can’t replicate true intelligence. They’re far better at processing massive amounts of data than a single person could ever be, which is exactly what makes computers so awesome. Other interesting uses of machine learning include personal assistants, such as Siri, and the algorithms Facebook uses to recognize faces. Let’s now move on to the topic of SEO. A lot of the work we do to optimize content for search engines comes down to technical details. For example, we make an effort to include keywords in headings and near the start of articles. You also have to keep keyword density in mind and pay attention to the way you use external and internal links. Even if you nail all those tasks, your content might still flounder if you don’t pick the right keywords to begin with. Theoretically, machine learning could help you tackle all these tasks more efficiently. This would help you produce content that is more search-engine friendly without requiring a background in SEO. However, the brunt of the work, which is creating interesting content will still fall upon you. Machine learning isn’t yet at the stage where it can take care of all the grunt work for you. However, there are some tools that claim to be able to help you structure your content more efficiently, which is important from an SEO standpoint. We’re now going to look at one of them and see what it can do for you. The WordLift Artificial Intelligence plugin is an ambitious project that aims to help you enrich your WordPress content with contextual information. For example, the plugin can analyze your content to find related information, such as persons, locations, and that are mentioned. It can then use that information to pull contextual data from external sites, such as Wikipedia, and display it to your visitors. Moreover, the plugin can help you add Schema markup to your content, making it easier for search engines to understand what it’s about. Those two features alone are interesting enough, but the plugin goes a step further. It can also help you enrich content with relevant open-source images, links to other related pieces, and visualization widgets. In most cases, these are all tasks you’d need to perform on your own, without the aid of any tools. WordLift doesn’t do the work for you automatically, but it can provide you with the data and tools you need to do it more efficiently. Analyze your content and add contextual information so users can better understand it. Add more internal links to your content, to increase time on site. Find and add images you can use to enrich your content. Generate timelines for your articles. Add maps to display locations mentioned in your pieces. Recommend relevant articles to your readers. Improve your internal search feature using the data generated by WordLift. Add schema markup to your articles. Next, the plugin will ask you under which directory it should add contextual data to your website. The default is set to wiki, and you’ll also need to choose a language for the plugin to work. While the plugin supports multiple languages, each key can only be associated to one language. Overall, the onboarding process is very smooth, so let’s check out how the plugin does in action by loading a post. All you have to do is drag-and-drop images into the editor, and you’re good to go. It’s a timesaver, to be sure, but it only works well for broad terms. For example, the plugin wasn’t much help with articles that deal with very specific tech terms. Overall, we walked away pleasantly surprised by what this plugin can achieve with machine learning. It’s a good option if you want to add more contextual information to your posts and improve their metadata structure. Moreover, it’s compatible with other SEO plugins, such as Yoast. However, the one thing it can’t do is help you write better content. Moreover, right now the plugin is still in its earlier stages, and it doesn’t play nice with plugins such as the Divi Builder or Gutenberg. That means it’s only a valid option if you use the default WordPress editor and you don’t mind paying a relatively hefty subscription fee. Machine learning might change the way we tackle SEO as more and more services begin to provide such approaches to their users. However, we’re still nowhere close to the point where SEO tools can take care of all the work for you. 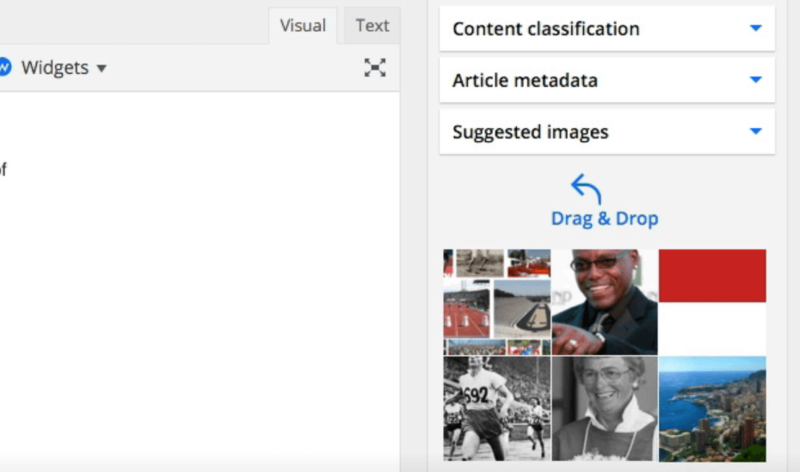 Plugins such as WordLift can help you by improving your content’s metadata and pointing your readers towards other posts they might be interested in. It can also enrich your posts’ metadata, but even that can’t ensure better search engine rankings if your content isn’t interesting to begin with. How do you think machine learning is going to impact SEO moving forward? Share your thoughts with us in the comments section below! We are working to provide full compatibility with Gutenberg, and why not discuss the best option to make WordLift compatible with the Divi builder. We’re testing on several websites our WordLift Cloud (https://docs.wordlift.io/en/latest/wordlift-cloud.html) that, with a single line of code, brings NLP & Structured Data Markup without interfering with the page building phase. Thanks for this plugin, looks awesome and I’ll probably test it soon! You said it’s not compatible with Divi Builder, but can’t it be used either in the Divi back end? Hi Gillian, yes indeed – we use DIVI ourselves 😀 and WordLift works just fine. I’ve been interested in WordLift for some time now but have also had concerns about the inability to work with page builders. It’s great to see you are working on a solution to that problem. When do you think it will be available? Hi Adam, write to me directly and I’ll send you a test key for WordLift Cloud. However, don’t you think the metadata the plugin gets from wikipedia etc. is considered as “duplicate content” ? Hi Gillian – we encourage editors to become the Wikipedia of their niche by curating the entities they care about (read more about here: https://wordlift.io/blog/en/8-rules-create-vocabulary-wordpress-website/). WordLift provides a very basic abstract derived from DBpedia (DBpedia is a knowledge base containing content extracted from Wikipedia that has been used for the training of our NLP) or any dataset the client wants to use (WordLift can be fed with curated data that an organization might have already). The abstract helps readers understand a specific term without the need to jump on Wikipedia – and yes, if the editor doesn’t personalize it – we recommend to prevent indexation by removing it from the sitemap (or adding a noindex). Have been interested in schema markup for some time, but just haven’t had the time to deal with it. Will definitely take a look at the plugin. Hi Bruce, this is Gennaro from WordLift. That is actually an interesting case study. We’ve also helped other online publishers similar to yours. The thing is in those cases the plugin might do exceptionally well because you can build up a vocabulary that expands on what WordLift finds by default, thus making your site unique through the eyes of Google and other leading search engines. I actually took this article: http://www.kentucky.com/news/politics-government/article142003314.html (not sure if that is the one you were referring to) and there are a few interesting suggestions coming up like “Republican Party,” “Legislature,” “bill” and many other interesting suggestions. Unfortunately, though there was not “I got nothing” 🙂 If you want to give it a try that out I’d be glad to give you a walkthrough. Thank you so much Jason! Reminds me of some of the tools from 8 years back, like Scribe SEO (still exists but not as a standalone plugin anymore), InboundWriter (WordLift reminds me of InboundWriter the most) and Zemanta (images and relate links/articles from around the web). At a highlevel, I have a lot of lessons learned from using tools like Zemanta to source images from around the web. Easy at the time, total pain in the next to cleanup in wordpress sites after that service bit the dust. For image liability reasons, I don’t recommend any images other than the ones someone buys a license for these days. Too many lawsuit schemes and scams out there. But I really like the sound of the schema stuff. I miss InboundWriter quite a bit. It really helped to draft blog articles with SEO keyword possibilities, demand and more visibly present while I was writing. I still use Scribe SEO (via my Raventools subscription). It is excellent for onpage optimization of copy after a draft is pretty solid. Definitely, gonna keep this plugin on my radar, and maybe give it a spin in the future. I couldn’t agree more on how ‘AI’, ‘NLP’ and ‘Semantic Web’ shouldn’t be necessarily part of the customer journey; focusing on the results that a tool like WordLift can bring makes way more sense. Sourcing content from publicly available resources such as the Wikimedia Commons can be troublesome and we have an option to let WordLift use only content from the local vocabulary. Seems wordlift also using DIVI theme! Will wordlift work for non English content? Hi Viktor, WordLift supports currently 32 languages including Indonesian. You can find here the complete list here (https://docs.wordlift.io/en/latest/faq.html#what-are-the-languages-supported-by-wordlift). Hi Viktor, WordLift supports 32 languages! Here’s the list: Chinese, Danish, German, English, French, Italian, Dutch, Russian, Spanish, Portuguese, Swedish, Turkish, Albanian, Belarusian, Bulgarian, Catalan, Croatian, Czech, Estonian, Finnish, Hungarian, Icelandic, Indonesian, Latvian, Lithuanian, Norwegian, Polish, Romanian, Serbian, Slovak, Slovenian, Ukrainian. Hey, guys! I have been using this dysfunctional software for 2 weeks. And here to report. 1. It cannot process entities in single post. I get the “timeout server” messages all the time. Sometimes it takes 3 minutes for a single post to be published. 2. Some articles are cannot be processed by this plugin at all!!! “error occurred” all the time in this plugin. 3. I have only 1 article where I have 650 words. It was easy. And you know some of my articles are 2500 words. Those are the worst. So if you have long articles like me. You don’t want to use this plugin. 4, This plugin is quite “stupid”, definitely not powered with AI. it finds in my every article songs of: Iggy Azelia, Stay – Rihanna, Secret – Madonna, One – U2. I have no idea why. They are not in the articles. I did not mean them at all!! And you know you cannot abuse the rich snippets and deceive google with facts that are not related to your article in order to stand out in search results. They are selling raw untested tech with those side effects and not known benefits to me at this point. Freebase and the API is non working. I saw it!! I mean, Andrea does not have an integrity as a business person. He is unethical. I was experiencing those issues and he offered me 60 days free trial while those issues resolved. And then they decided to charge me anyway! I live in America. I have never seen anyone do business this way.